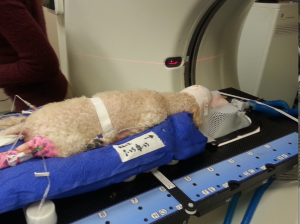 Baci, a 13-year-old Toy Poodle, began having seizures in February of 2015. After examination and an MRI, Baci was diagnosed with a right frontal lobe meningioma, a brain tumor. At the time of the MRI Baci was no longer alert and responsive; he was comatose and resting in O2 cage at the veterinary hospital. Traditional radiation therapy is the gold standard of care for a patient with Baci’s diagnosis, but treatment can take weeks to months for the benefits to be realized and serious side effects can occur. Chemotherapy and steroid use were also discussed with the family, but due to the location of the tumor and Baci’s neurological status, prognosis was poor. Baci’s care team at PetCure Oncology at Veterinary Radiosurgery and Imaging Center in Clifton, New Jersey decided stereotactic radiosurgery (SRS) was the best treatment option. SRS is a non-invasive and non -surgical treatment in which high doses of precisely focused radiation beams destroy the tumor. SRS does not remove the tumor. Instead, it replaces the surgeon’s scalpel with a high dose of radiation that destroys tumor cells with minimal damage to nearby healthy tissue. Baci received SRS treatment during the last week of February 2015; his prognosis was 6-12 months. As of early October 2015, Baci is back to competing in the Rally Obedience Ring and winning ribbons. 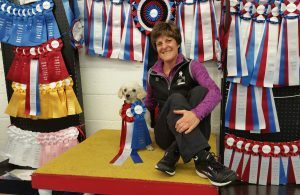 Watch Baci take 1st Place and win the veteran’s class championship title! Questions about pet cancer? Contact us. If your pet has been recently diagnosed with cancer, we are here to help. Contact a PetCure Oncology location near you to schedule a consultation.